Retail sales decreased 0.9% to $50.4 billion in November on lower sales at gasoline stations and motor vehicle and parts dealers. Excluding these two subsectors, retail sales increased 0.2%. Sales were down in 6 of 11 subsectors, representing 75% of retail trade. After removing the effects of price changes, retail sales in volume terms declined 0.4%. Sales at gasoline stations declined for the third time in four months, decreasing 5.0% in November. The decline was largely attributable to lower prices at the pump. In volume terms, sales were down 1.5%. Sales at motor vehicle and parts dealers (-1.8%) decreased for the first time in four months. Sales were down in three of the four store types within this subsector, with the largest decline at new car dealers (-1.9%). Lower sales at food and beverage stores (-0.9%) were attributable to a 1.2% sales decrease at supermarkets and other grocery stores. Sales at general merchandise stores increased for the third time in four months, rising 1.7% in November. Retail sales at cannabis stores increased 26.2% in November to $54.4 million. Sales in October totalled $43.1 million during the two-week period following legalization. Retail figures will vary as new stores continue to come on line and the marketplace continues to evolve in the period following legalization. Following six consecutive monthly gains, sales in Ontario declined 1.6%, largely due to lower sales at motor vehicle and parts dealers. Sales in the census metropolitan area (CMA) of Toronto were down 1.5%. Sales in Quebec (-1.5%) declined for the third time in four months. Sales were down at gasoline stations and, to a lesser extent, motor vehicle and parts dealers and food and beverage stores. 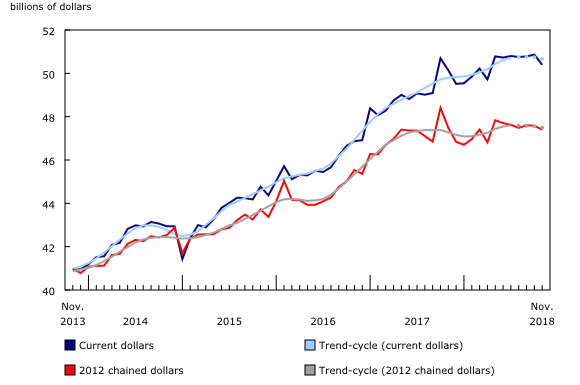 Sales in the CMA of Montréal decreased 0.8%. Sales declined in all four Atlantic provinces in November. The decrease was mainly due to lower sales in Nova Scotia (-5.4%), with all subsectors reporting a decline, partly due to severe weather conditions in the province. The largest decline came from motor vehicle and parts dealers. Alberta posted a 1.9% gain following three consecutive declines. Higher sales at motor vehicle and parts dealers more than offset a decline at gasoline stations. On an unadjusted basis, retail e-commerce sales reached $2.3 billion in November, accounting for 4.2% of total retail trade. On a year-over-year basis, retail e-commerce increased 20.1%, while total unadjusted retail sales rose 1.1%. As of October 17, 2018, the date of legalization, the monthly retail trade survey now collects and disseminates sales of licensed cannabis stores. This includes both in store and Internet-based sales. Real-time tables 20-10-0054-01 and 20-10-0079-01 will be updated on February 4. Data on retail trade for December 2018 will be released on February 22, 2019.